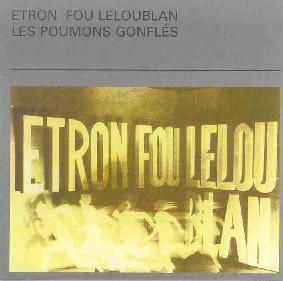 Etron Fou LeLoublan - "Les Poumons Gonfles"
The Musea Records sub-label, Gazul, continues it's series of Etron Fou LeLoublan CD reissues with Les Poumons Gonfles, the bands fourth album, and the one that came to define what was for me the classic Etron Fou sound. Joining the core of Guigou Chenevier on drums and vocals and Ferdinand Richard on bass is Bernard Mathieu on saxophones and Jo Thirion, whose keyboards wonderfully augmented their already trademark sound. The album was produced by Fred Frith who also contributed violin and guitar on two tracks. The band come roaring and rocking out of the starting gate with "Nicolas". The repetitive wailing horn is like a manic duck call, the bass and drum patterns propel the rhythmic pulse, and Guigou's inflamed vocals inject as much passion into the music as the instruments do. Jo Thirion's keyboards are, on one level, so simple, and yet they are a key element of the bands quirky style, lending a kind of avant New Wave feel to the music. "Mimi" features the morphing of New Wave and jazz into a unique avant-prog stew. "Nicole" and "Lo Prefero" each include off-kilter rhythms and a strange mixture of playfulness and intensity that transitions through multiple themes. They're also among the most musically adventurous tracks of the set. I love the experimental circus-like Cabaret feel of "La Musique" and "Pas L'sou". "Those Distant Waters" consists of beautiful haunted house keyboards and spacey effects that ultimately blast off into an avant jazz-rock jam. And "Upsalla" showcases the band at their most playful, a sense of humor and fun while creating serious music being a large part of what made Etron Fou such a great band. But nothing approaches the power of the album's highlight track, "Christine". It's a killer avant-prog power rocker with excellent guitar contributions from Frith and a low end rolling bass that pounds the pit of your chest. And then in its last couple minutes that song segues into a quirky jazzy bit that closes the song. One of my all time favorite Etron Fou songs. In summary, Etron Fou LeLoublan are essential listening for anyone interested in the history RIO/avant-progressive rock. Their mark is such that are in the "sound like..." portion of countless reviews. The curious will find this album an excellent starting point.